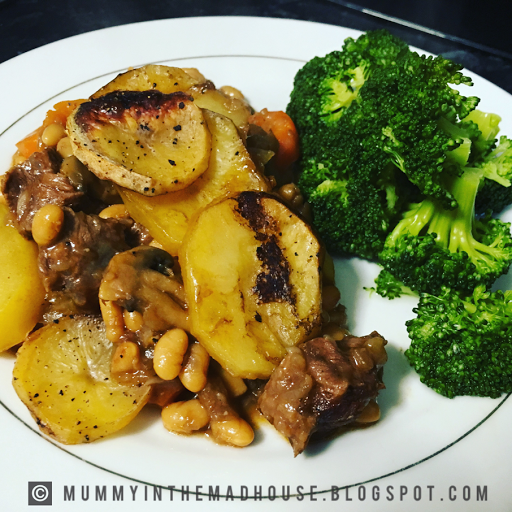 This Beef & Bean Hotpot Bake is a family favourite of ours. It's super tasty & easy to make. Beef & Baked Beans are a great combination & with the addition of a sliced potato topping this meal is comfort food at its best. Definitely a winner in our house. This meal takes about 20 minutes to prep & 3 hours cooking time. Which is perfect for me as I can put this dish in the oven at 2.00pm & will be ready by dinner freeing up the afternoon when the children get in from school. Place the beef, onions, carrots, mushrooms & flour in a baking dish, season & toss to mix. Pour in the boiling hot beef stock then add the Worcestershire sauce & baked beans, stir to mix well then place the sliced potatoes on top of the mixture. Cover with foil then place in the oven for 3 hours or until the potoatoes are cooked & tender. 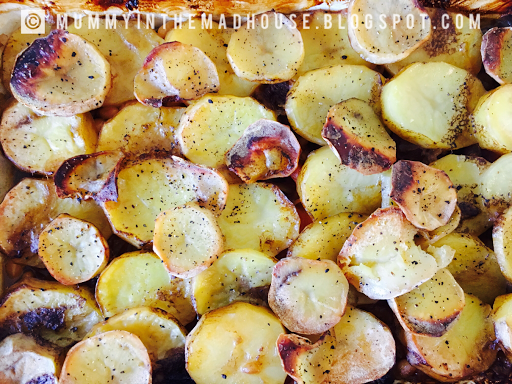 Remove the foil, then turn the oven up to brown the potatoes. I teamed my hotpot with a side of broccoli just to add more veg in my dinner.